You can use this technique to create a default package and deploy it to multiple stages. I named my stage as my environment (preview), and I created a web.config file for that environment (web.preview.config) file. All my environment configuration files in the same path as Web.Config file. I can see that it first transformed to release and then it applied preview as the doc says (release then environment). However, although it says XML Transformations applied successfully, when I check the config variables, they are not changed. The only way I could make the transformation work was to define the buildConfiguration variable when I queue a new build, which blocks me from using the same build for different environments. Web.config is transformed during the build process, if you generate the deployment package from "Build" and then deploy it in "Release", then you cannot transform it before deployment. But the doc said I can use one default package for multiple stages...Does that still mean I have to create separate build for each environment? Is XML transformation not what I should be looking at for the scenario I wanna solve? 1) Make sure you transform works. Test it here. 2) Ensure in your VS project that you are including the transform file, Web.Preview.config, and copying to output dir. 3) Disable the config transform during the build, you just need to add argument /p:TransformWebConfigEnabled=False in MSBuild Arguments section of your Build task. You also need to add /p:AutoParameterizationWebConfigConnectionStrings=False if you want to update the connection string during the release. This will use the Web.Preview.config to "transform" the web.config. 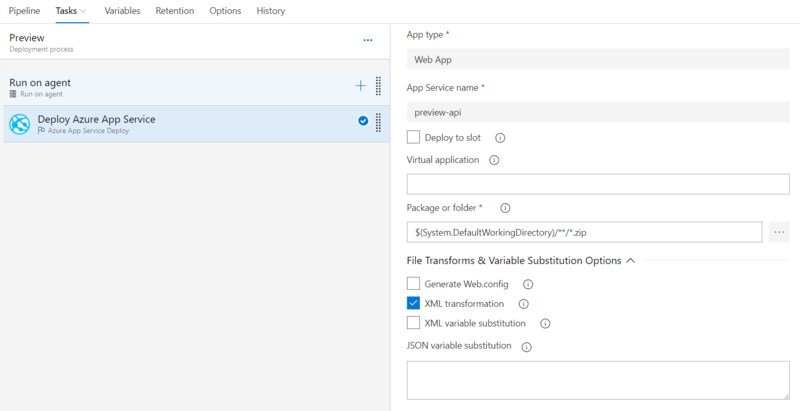 4) Double check that in your release for the IIS Web App Deploy task under File Transforms & Variable Substitution Options you have XML transformation checked. I just got this working so I could have one build with deployment to multiple environments. This is what I did. In the code, I set each Web..config property to Build Action = "Content". I also set all mine to Copy to Output Directory = "Copy Always". I also unloaded the project and edit the csproj file, then removed the Web.config lines. This dumps all your web.configs to the root (no file nesting). In the build, I set pipeline variable BuildConfiguration = "Release". I don't have a Web.Release.config in my project. In the release, I named the deployment stage after the environment (in my case, Development, Staging, and Production). In all stages, on the Azure deployment task, I checked the XML transform checkbox. In Azure, I set the ASPNETCORE_ENVIRONMENT to the naming of the staging environment, in my case, Development, Staging, and Production). I just got this working as well. My issue was actually at the Visual Studio Solution level. I had the MVC project pointed to a different Configuration than the others. So always double check the configs! Not the answer you're looking for? Browse other questions tagged c# xml azure-devops or ask your own question. Why can't I deploy from Team Foundation Server, but I can from Visual Studio with the same publish profile?